Home » FAQ » I am not sure what media to print on – Canvas, Metal, Acrylic or Paper? I am not sure what media to print on – Canvas, Metal, Acrylic or Paper? I have seen my prints on all of the media that my print on demand provider, Fine Art America, offers. Really, it comes down to personal preference. I offer prints on Metal, Canvas, Acrylic and Paper. 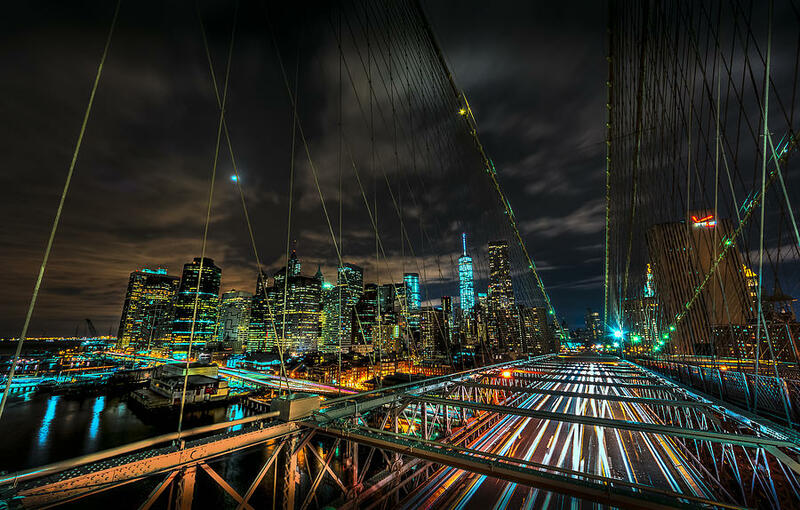 Metal prints give a depth of color that is great for when you want the picture to grab the attention of the room. Printed on 1/16″ Aluminum sheets, the print is backed with a hanging frame that will offset the pint from the wall by about 3/4″. All metal prints arrive “ready to hang” with nails and hangars included. 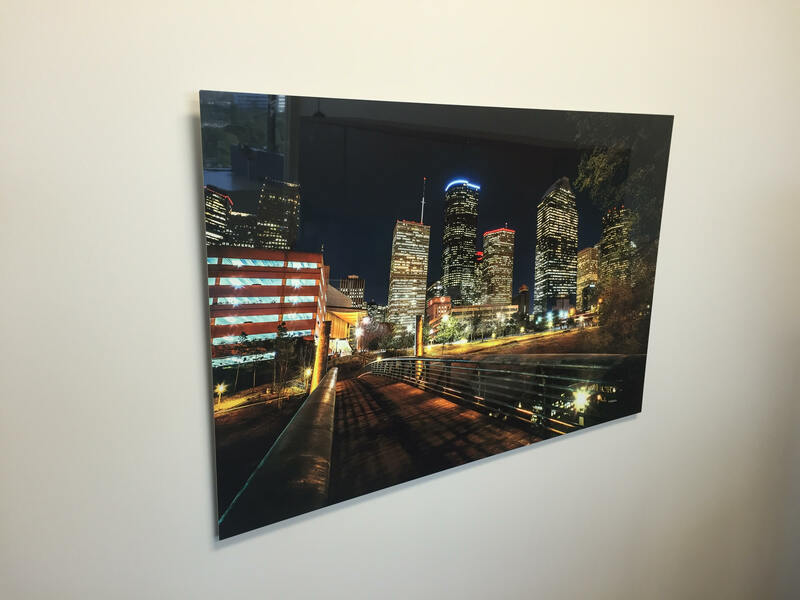 This 40″ metal print of Houston is hanging in my office and catches the attention of visitors. Fluffyshotme Photography was invited to participate in a Photography Exhibit recently and I chose a Metal Print to represent my work; it was definitely the right choice. Canvas prints are a wonderful aesthetically pleasing print media that I would also recommend for a commercial office application. The depth of color is rich, but not overstated and Canvas comes with the option of framing or hanging without a frame. Canvas prints can be ordered “ready to hang” already stretched on stretcher bars or unstretched and without a frame. There are two types of Canvas available for printing, there is a Glossy Canvas and a Matte Canvas, if you are undecided, I would recommend the Matte Canvas. Acrylic Prints are a favorite for their ability to stand out and grab the attention of the audience. Their depth gives the illusion that printing surface is throughout the entire depth of the acrylic print. There are two mounting options available with Acrylic Prints Mounting Posts or Hanging Wire. I recommend the Mounting Posts as they add a contemporary look to the display of the artwork itself. Paper Prints are probably the most commonly ordered print media from Fluffyshotme Photography. There are many choices of paper such as Premium Archival Matte Paper, Premium Glossy Photo Paper, Premium Semi-Matte Photo Paper, Premium Luster Photo Paper, Cool Tone Picture Rag, Somerset Velvet, Watercolor Paper and Metallic Paper; if you are undecided, you can order a sample kit for $5.00 to see which you like best before ordering by clicking here. If you are looking for a framed print, I would recommend ordering the print with the frame from our printshop. No matter what the dimensions of the print are, they will build a custom Mat and Frame to fit the print perfectly. You can choose from 150+ frames and 250+ mats for the perfect combination for your home or office. For those who are on a budget and may be thinking of ordering a paper print rolled in a tube in order to frame on your own, please pay close attention to the dimensions of the prints that I offer. Many of my prints are not standard sizes and will require custom framing; which is why I recommend ordering the frame with the print.